This dress by Kore has been crafted from pure viscose jersey and is exclusive to ASOS. 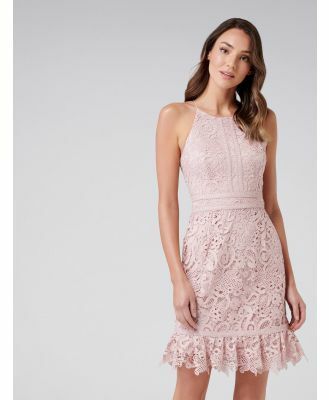 The details include: a high cut neckline with a double strand halterneck strap, a cut-out to the chest with a finely woven, handmade crochet trim, ribbed detailing to the waistband, gathered pleats to the skirt and a side zip fastening. The dress has been cut with a regular fit. Renowned for her sophisticated, Hellenic-inspired designs, Greek designer Sophia Kokosalaki presents new ethical collection, Kore, developed jointly with ASOS. Named after the ancient word for maiden, expect a youthful line of dresses, separates and accessories, intricately draped in opulent hues and prints. Handmade from organic cottons and silks, many pieces feature artisan lace, intricately crafted by entire communities of women in Sri Lanka.